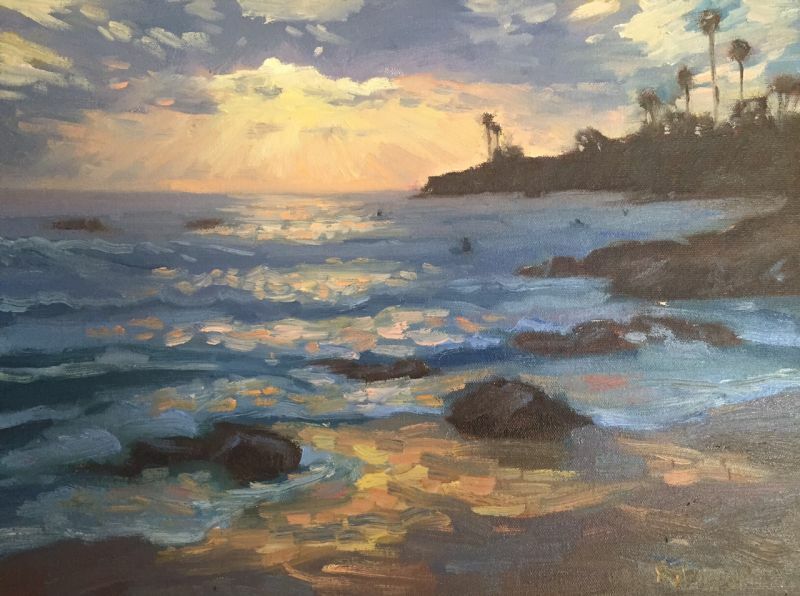 In this San clemente scene I was inspired by the activity of the group at this “surf camp”. 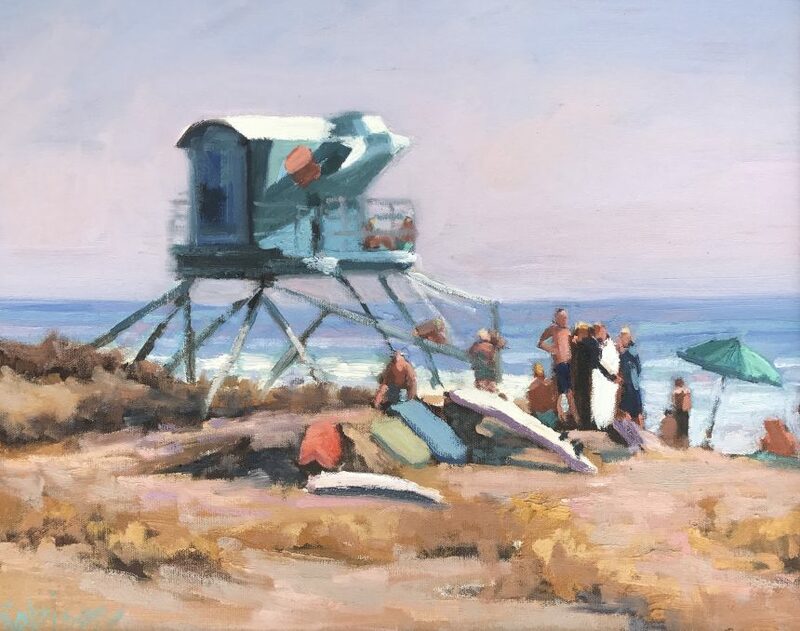 A few kids are having a conversation on the life guard tower, another is waxing his surf board, and others are huddled together following the instructors direction. Just getting the gist of the scene… with the crashing waves, and excited students…this scene has a certain beach energy. Such a fun way for kids to spend a summer vaccation. In “Umbrellas and Surf” 16×20, I was inspired by the many vibrant colors of the beach umbrellas. I loved this scene because the activity of swimmers, walkers, and sunbathers seemed to vibrate with the sparkling water and warm sand. 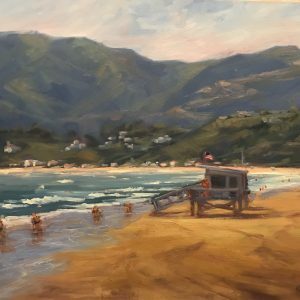 Instead of trying to render each beach goer, I just placed the people in with very simple strokes of paint. This painting has warm ochres, Naples yellow, periwinkle, blues, and a variety of orange and reds. The bathers at a distance looked like tiny dots of peach in the water. And the wind, on this day, kept the waves coming in quickly one after another. On this evening the colors of the sunset were glorious and beautiful; yellows, pinks, and oranges. Using thick textured paint I was able to sculpt the billowy clouds into the deep grey-blue sky. Little bits of orange reflect sky into the water. Sunsets are heavenly…eveytime I go to paint one, or photograph one, there is always good amount of photographers and on lookers there enjoying it with me. 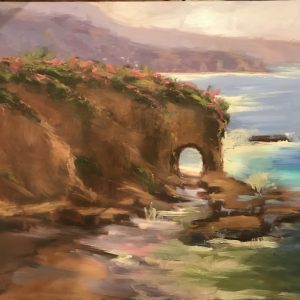 Whenever I see gorgeous color in the sky and I am in the area I try to go to the ocean and get a quick sketch or take a photo. Once I get there I am reminded how peaceful and centering it is to just sit there and observe nature……and I am thankful for that. Love clementines! You know the little tangerines. 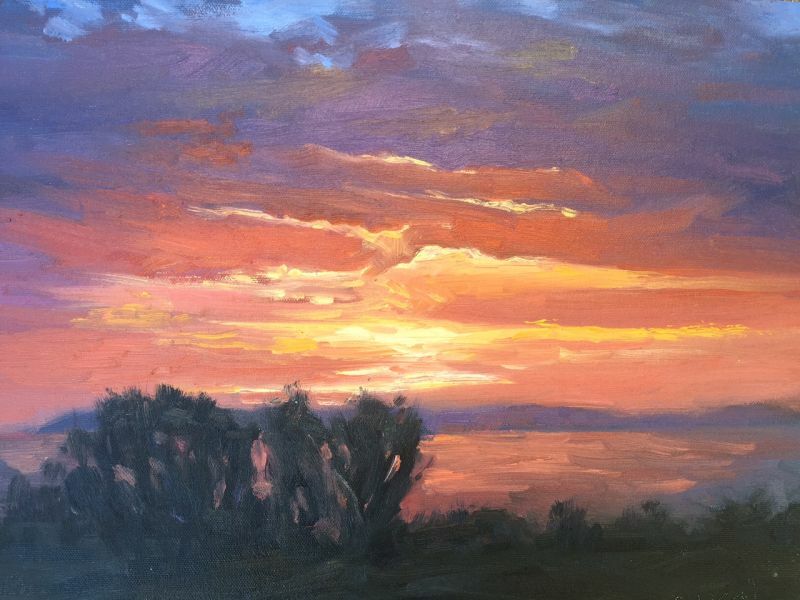 So I called this one “Clementine Skies” because it was so juicy to paint! …….Oh my darling, oh my darling, oh my darrrrrrling Clementine…,you were lost and gone forever, oh my darling Clementine. Sing it! Wow I just had a flashback to my childhood girl scout troop. We sang that song over and over I think to get a singing badge to put on our uniform. Just a pretty sunset at Crystal Cove State Beach, CA. The purple island is Catalina, California. Sunsets are amazing if you live on the coast. I hope you enjoy them often. 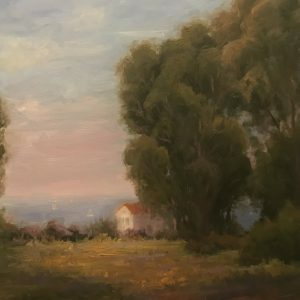 What is amazing about them, to me as a painter, is that in the span of 20 minutes, as the sun sets, there are hundreds of different color combinations to paint. As a painter the possibilities are endless. This particular painting, Clementine Skies, has many varieties of the color orange: tangerine, coral, peach, clementine, rose-orange, cantaloupe, apricot, bittersweet, carrot, salmon, titian, and red-yellow. This oil painting has thick paint in the white and yellow area and thin paint in the dark area. When the lights are out the painting glows…it creates its own light! 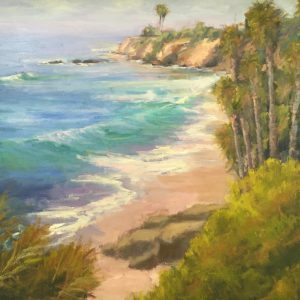 In this oil painting I used lots of blues, purples, and periwinkles for the waves and water. Yellow, pink, and orange for the sunset and water highlights. 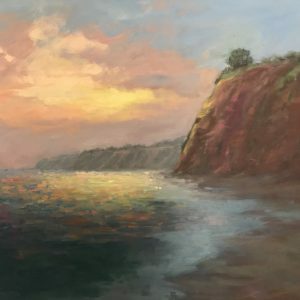 I was out walking and photographing the ocean when I decided to do an oil painting of this beautiful dusk-ish scene. I remember feeling a lot of anxiety and angst before taking a beach walk. Then the sunset turns into this drama in the sky with the dark clouds almost suppressing the setting sun. On this day before the sunset there were lots of surfers waiting for the next wave. Just floating out there wading in the ebb and flow. Such a peaceful scene of humanity just waiting in the waves. So zen…so one with nature. The ocean often reminds me of how small we humans are in the bigger scheme of things. It is kind of relaxing to think we are just another part of nature. There is a particular safety in the thought. Our lives are not such a big deal…….we can just float along with nature and relax…..that is….until the next big wave comes.